The advocacy of ending a FTA with Colombia is not a surprise to many, especially after Speaker Pelosi, House Majority Leader Steny Hoyer (D-MD), House Ways and Means Chairman Charles Rangel (D-NY), and Trade Subcommittee Chairman Sander Levin (D-MI) issued an ominous statement on June 29: “We believe there must first be concrete evidence of sustained results on the ground in Colombia, and members of Congress will continue working with all interested parties to help achieve this end before consideration of any FTA. Consequently, we cannot support the Colombia (agreement) at this time.” The statement was made in reference to a series of events such as possible ties between the Uribe’s administration and the country’s notoriously brutal paramilitary groups, one of the highest counts of human rights abuses in the hemisphere, the woeful failure of Plan Colombia to derail drug-trafficking, his inability to apprehend or demobilize groups labeled as “terrorists” by the U.S. and an ending string of scandals and acts of corruption including, the misuse of U.S. funds, as well his imperious removal of Washington’s long-favored policy of being able to extradite Colombian felons upon request. What Made the Democrats Walk Away? In recent months, President Uribe, when he was not squandering money on U.S. public relations firms, made two unprecedented lobbying trips to Washington in hopes of swaying Congress in his favor. This is partly attributable, in short order, to the current investigations against twelve of Uribe’s congressional allies who are awaiting trial for possible connections to right-wing death squads and paramilitary groups—a claim he denies despite years of rampant rumors. The accusations that members of Uribe’s administration have ties to paramilitary groups invited a significant first step in the cutbacks of U.S. aid for anti-drug trafficking efforts. The House approved $530.6 million in aid to Colombia, $60 million less than the Bush administration requested, with real prospects that it could be further slashed. Another leading factor motivating the punitive rhetoric from the House Democrats is that in 2006, Colombia led the world in the number of trade union officials assassinated, with more than 70 deaths confirmed. This is one of the particularly damaging statistics of human rights abuses that have plagued the country and have further whittled down Colombia’s supporters in Washington. 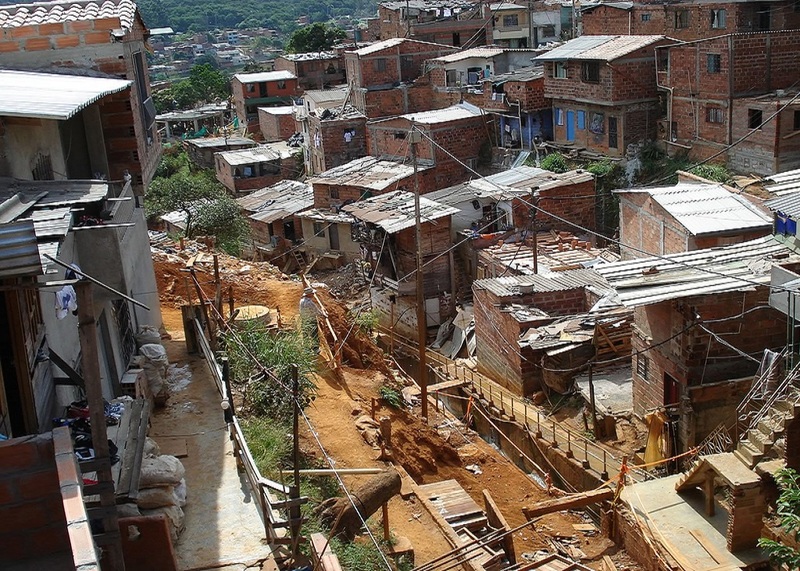 Additionally, the appalling number of more than three million displaced Colombian civilians has kept Bogotá in the crossfire of criticism for its daily derelictions of such internally displaced persons, Uribe’s indifference to issues of social injustice and Colombian’s incredibly unequal distribution of wealth. Furthermore, in 2000, near the end of the Clinton administration, the U.S. decided to financially contribute to Plan Colombia in an effort to derail the drug trade and reduce cultivation of the coca plant by 50 percent. However, as Senator Patrick Leahy (D-VT) has argued: “When Plan Colombia began, we were told it would cut by half the amount of cocaine in five years. Six years later and $5 billion later, it has not had a measurable effect on the amount of cocaine entering our country.” The Plan has allocated millions of dollars on controversial aerial fumigation programs against the coca plant. However, according to the U.S. State Department coca plant acreage has increased 27 percent since the program began. In June of 2003, Uribe initiated peace talks with the right-wing paramilitaries aimed at preparing for their demobilization. The United Self-Defense Forces of Colombia (AUC), an umbrella group of the country’s numerous vigilante death-squads, proceeded to turn in a list of some 30,000 paramilitaries prepared to commence the demobilization process, which is a far higher figure than previously has been attributed to their troop strength. Many see in these numbers what could be the making of a new scandal based on drug traffickers conniving with Uribe and the AUC to allow common criminals and drug traffickers to profess AUC membership. This allows them to qualify for demobilization under the terms of Uribe’s generous peace plan and to avoid being extradited to the U.S. to stand trial. Instead, under Uribe’s no-extradition pledge and under the terms of his demobilization plan, felons may serve minimal sentences and pay an insultingly small compensation figure to their victim’s loved ones. According to Latin News, the Organization of American States (OAS) has claimed that paramilitary groups “had reappeared in 16 of Colombia’s 32 departments,” thus implying that Uribe’s implementation of the program lacks sufficient enforcement. The recent 6-day trip to Latin America by Canadian Prime Minister Stephen Harper began in Bogotá. A trip of this sort has not occurred since former Prime Minister Paul Martin’s visit in 2004. This perhaps reflects a sudden desire for Canada to get more involved with Latin America at a time when the U.S. has lost much of its regional influence. Yet, with Harper’s pursuit of improving relations with Latin America, The Economist wryly observed that “Canada cannot hope to rival U.S. economic and political influence in Latin America.” Even if The Economist knew what it was talking about (what “political influence” does the U.S. actually have in Latin America?) one can ask why, then, did Harper decide to pursue a foreign policy trade initiative in South America? A major reason that comes to mind is that Ottawa believes that given the $100 billion, which Canada has already invested in Latin America, the region has long been an attractive place for Canadian companies in which to invest, especially in oil and mining areas. Its pursuit of new investments and its emphasis on market factors signify that, to paraphrase Calvin Coolidge, the business of Canada is business. Specialists in hemispheric politics observe that it has been decades since Canada has had its people follow Latin America in a less competent way than under Harper. It is questionable whether the Canadian Prime Minister had any motives, any insights, any clarity, in fact, any information whatsoever with the most important bilateral U.S.-Canadian issues at play. What is at stake is Canada’s reputation as a high-minted symbol for public rectitude and the politicians’ projections of a principled government known for its integrity. Under Harper, Canada’s image is being man-handled, and the absence of any comprehension of hemispheric issues parallels that of the Bush administration. The decision by many Democrats to walk away from the FTA with Colombia is commendable, especially considering the tainted reputation of Uribe and his country’s modern history. As for Canada, it seems plausible that its notably sterling reputation may not survive Harper’s visit to the region, his pedestrian language and trivialized insights into what he refers to as his “neighborhood,” which in the pre-Harper days, was well understood in Ottawa.